If what is reported is true, then it is really a big day for capitalism. [Click here for the full report] It may be that he doesn't represent the stature which Marx occupied, but Joyti Basu is a big name in India. So when he says that Socialism has failed to bring in the benefits and has to give way to capitalism, it really carries a lot of weight. "We want capital, both foreign and domestic. After all we are working in a capitalist system. 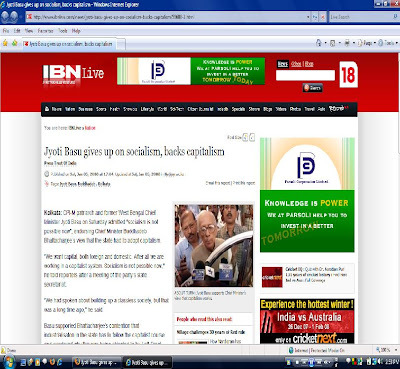 Socialism is not possible now," he told reporters after a meeting of the party's state secretariat. "We had spoken about building up a classless society, but that was a long time ago," he said. Basu supported Bhattacharjee’s contention that industrialisaton in the state has to follow the capitalist course and wondered why this was being objected to by Left Front allies. "Socialism is our political agenda and was mentioned in our party document, but capitalism will continue to be the compulsion for the future," said Basu. This indeed has huge implications for the polity of the country as the Left has been an important heavy-weight in the Indian political diaspora with its influence at the centre growing with times. Mr. Basu is a respected Left leader and if he comes out in public in favour of captialism, which implies denunciation of socialist principles, then this Left faces a huge political and in-principle make-shift. In any case, I agree with Mr. Basu's views. This state has been working on a pattern totally on reverse lines with the national economy's movement. At one time Kolkata (when it was Calcutta) was one of the major economic centres of India. But then the changing times and affluence of other areas have seen this city crumpling down in its share and positioning in the Indian markets and similarly the pattern has spread across the entire state. The artificially maintained low cost of living and prices of goods has had the state to be cut off from the other parts of the country, which makes it unable to share the growth and success story of a rising nation. I am aware of the cultural and political thought prevailing in that part of India which makes such situation inevitable but then when this was the case with the other parts of India, the economy only grew with what is called as the Hindu growth rate of about 2-3%. But when the rest of India dispensed with its native and traditional practices in the economic segment, we have seen a massive rise and growth. This gives another reason for this socialist-front-dominated-state to adopt the change with the changing times. And when this cannot happen with socialism, it is required to be done away with. I do not want to pick the incidents but then it seems irresistible to cite them in order to show the glaring lack of conformity in the professional cultures of this part of India with the rest. The lack of compassion for the entrepreneurs, the frequent lock outs and bandhs, the constant use of strike for all and sundry purposes, the state has seen it all and has suffered itself now. But then it is never too late to change and I believe things will change soon enough before more disadvantage is meted out to the inhabitants of this part.